Size: 5 1/8" x 6 7/8"
Cardboard Gold European first day cover sleeves are manufactured using the highest clarity polypropylene available. CBG's state of the art factory ensures that EVERY bag or sleeve is made to the proper size with the strongest seals in the industry. 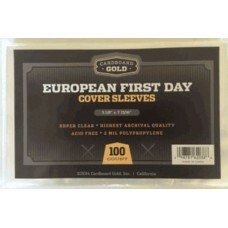 Do you have any questions about Pack of 100 CBG European First Day Cover 2 Mil Poly Sleeves?